Irish moss, a common red algae in the Narragansett Bay area. 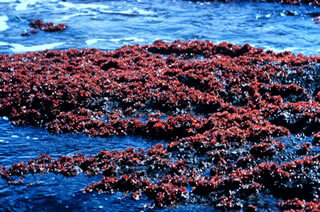 Alternate common name: Red Seaweed. Appearance: Reddish brown seaweed with flattened blades that fork off into rounded tips. Grows 2 to 6 inches tall and 4 inches wide. Habitat: Inlets, tide pools, and lower intertidal zone. Irish moss is a red seaweed with flattened blades that fork off from a short stalk to form fingers with round, blunt tips. The blades taper towards disk-shaped holdfasts, which are actually root-like anchoring structures. Typically, the blades are flat and slender. Irish moss is usually deep purplish red, but may also be white, brown, or green. When washed ashore, it will bleach to white. When found in shallow waters, Irish moss has blades that spread and take on a broader form. In deeper, subtidal zones, Irish moss blades are narrower. It generally grows between 2 to 6 inches high and 4 inches wide. Each blade is flat and rubbery with crimped edges. Irish moss usually grows in clumps. It can withstand extremely cold water temperatures and can survive freezing during the winter months. Irish moss is found in the middle of the intertidal zone, below the rockweeds, and above the kelp. It is less slippery than other intertidal seaweeds, allowing for safer footing on rocks than rockweeds and kelp provide. Irish moss is used as a thickener in soups and dairy products, and it is harvested in New England to produce an extract called carrageenan. Carrageenan is a gelatinous carbohydrate used to emulsify dairy products, baked goods, and cosmetics. It is also used to clarify beer, tan leather, and package fish and meat. This plant earned the nickname Irish moss because it grows in Ireland, where it was used in cooking and as a medicine long before Europeans introduced it to Rhode Island.